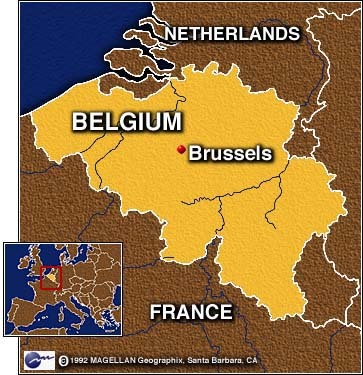 BRUSSELS, Belgium (CNN) -- The NATO pilot who bombed a rail bridge in southern Serbia was unable to see a passenger train on the bridge until the instant before his missile struck, NATO's top general said Tuesday. 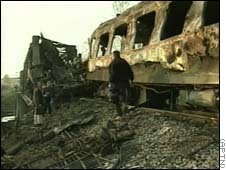 The Monday attack left at least 10 dead aboard the train and injured another 16, Yugoslav authorities said. The pilot was using a remotely targeted missile he fired from several miles away, said Gen. Wesley Clark, NATO's supreme commander in Europe. 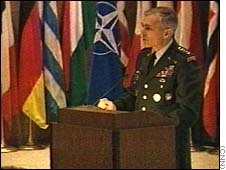 He spoke to reporters in Brussels on Tuesday, the 21st day of the NATO air war against Yugoslavia. Clark said the pilot was steering the missile from the cockpit of his plane when, "all of a sudden, at the very last instant, he caught a flash of movement." At that point the pilot could not steer the bomb away from the train, he said. "It was locked, it was going to the target and it was an unfortunate incident we all regret," Clark said. The pilot fired a second missile in an attempt to hit the opposite end of the bridge, Clark said. But by "an uncanny accident," the train had slid forward, moved across the bridge and ended up in the missile's path. "In both cases there was an effort made to avoid collateral damage," Clark said. "We're sorry for it, because we are doing our absolute best to avoid collateral damage." Clark showed reporters a videotape of the attack, in which the train darts into view on the bridge barely a second before the missile's impact. Milisav Paic, a Yugoslav Foreign Ministry official in Belgrade, called Monday's deaths "a war crime done against innocent civilians." 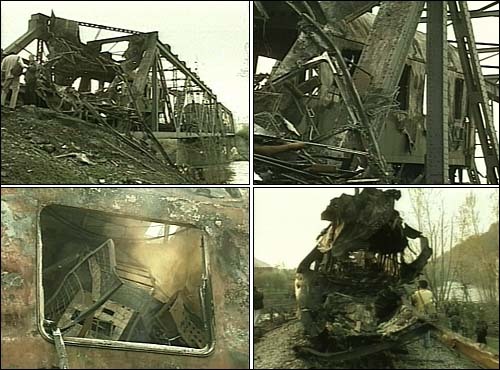 NATO pilots have attacked bridges as part of the alliance's effort to disrupt supply lines to Yugoslav forces. The air campaign continued Tuesday, with allied commanders tripling the number of planes flying bombing missions over Yugoslavia. 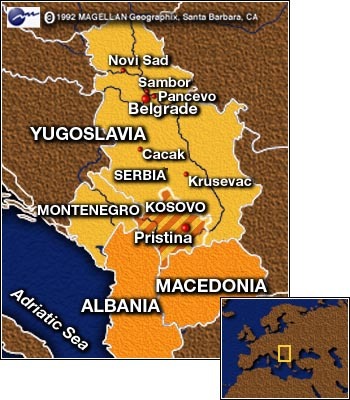 Airstrikes concentrated on cutting off the flow of fuel to the Yugoslav army in Kosovo. Clark said the missions have damaged or destroyed about 70 percent of the country's petroleum storage capacity. With fuel stocks depleted, commanders of the roughly 23 battalions in Kosovo are being told to avoid moving their troops, he said. "He's taking fuel away from civilian consumption and trying to hoard it for military use," Clark said. Clark said additional measures -- "diplomatic and otherwise" -- would be in place soon to further shrink the Yugoslav army's fuel supply. 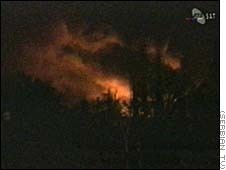 Oil refineries in Pancevo and Novi Sad, both hit in other recent attacks. A fuel depot east of Sambor, farther north of Belgrade. A factory in the central Serbian town of Cacak, south of Belgrade. Two bridges, one described as old, the other as new, in Krusevac. 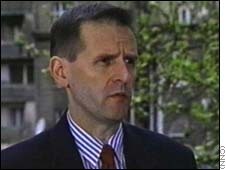 Gen. Charles Guthrie, the British chief of staff, said the air campaign is taking a toll on Yugoslav army morale. "Our attacks are having a noticeable and destructive effect, and units are becoming increasingly isolated," Guthrie said. Meanwhile, the alliance was still pursuing diplomacy in hopes of finding a way to end the crisis in Kosovo, which has left nearly a million people displaced. The United States and Russia, trying to resolve their differences on the matter, announced general agreement on basic principles Tuesday. But they remained at odds on key issues, including an international peacekeeping force for Kosovo. U.S. Secretary of State Madeleine Albright said her three-hour meeting with Russian Foreign Minister Igor Ivanov was "an honest discussion." Tuesday's talks came one day after NATO ministers considered having Russian and other European troops join in enforcing a settlement in the province if Yugoslavia accepts peace terms. 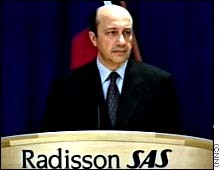 Ivanov said Yugoslavia must approve any international peacekeeping force sent to Kosovo and he insisted airstrikes must stop before there could be a political settlement. 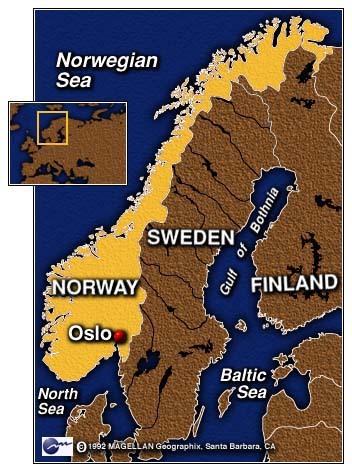 "The sooner NATO ceases airstrikes, the easier it will be to find a settlement," Ivanov said at a joint news conference after the talks in Oslo, Norway. 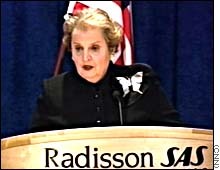 Albright said the two sides agreed, at least in principle, that there must be an end to repression, a pullout of Serb troops and police from Kosovo and a return of refugees to their homes.